Asheville and the small towns around it are full of talented artists and craftspeople who have found their inspiration and make their living in the mountains. Take part in art strolls of galleries and artists’ studios in places like the River Arts District and downtown Asheville. Attend an annual art festival, such as the Lake Eden Arts Festival (LEAF) and the Sourwood Festival in Black Mountain, and the Craft Fair of the Southern Highlands in Asheville. Check out the Folk Art Center, with its permanent collection of arts and crafts by the Southern Highland Craft Guild and various exhibits and craft demonstrations throughout the year. Asheville even has an Urban Walking Trail, which divides the city’s history into different time periods. Stroll a little over a half mile around the city along a route that contains 30 bronze sculptures made mostly by local artists, educating visitors about events and important people in the city’s history. Constructed by George Washington Vanderbilt in the late 1800s, Biltmore House is 175,000 square feet of gorgeous architecture and opulent furnishings, not to mention ridiculously outstanding views of the Blue Ridge Mountains. Surrounding it are 8,000 acres of gardens, a Conservatory filled to the brim with trees and plants, and Antler Hill Village and Winery, which offers complimentary tastings (our favorites: the Sangiovese, the Limited Release Malbec and the Chenin Blanc). Antler Hill Village also includes a farm with petting zoo, as well as an outdoor center that offers horseback riding, bike rentals (or bring your own bike and ride the trails), river float trips, archery, shooting clays, fly fishing lessons and even Segway tours. 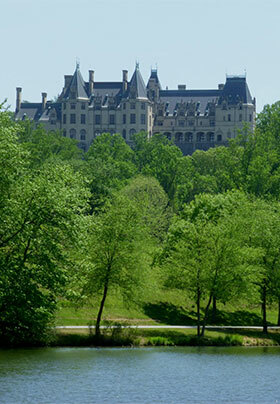 Tickets to Biltmore Estate for our guests are always at a discount when purchased here at the Inn, can be used any day, and are good for the following day for FREE. As a site on the North Carolina Birding Trail, Mountains Region and hotspot on eBird, we see birding enthusiasts throughout the year. With so many different elevations and microclimates in the area, you don’t need to go far to see some great birds. We highly recommend signing up for a day trip with Ventures Birding Tours during your stay at Inn on Mill Creek. Ventures owner Simon Thompson and his guides have led birding excursions all over the world and right here at the Inn. If you’d like to schedule a custom tour with a Ventures guide, please inquire with us in advance for availability and pricing. Stretching from the edge of the Great Smoky Mountains National Park in North Carolina to the Shenandoah National Park in Virginia is the 469-mile Blue Ridge Parkway, a breathtakingly scenic byway that meanders through the Appalachian Mountains. We happen to think the most beautiful part of the Parkway is right here in the Asheville area. And the entrance to the Blue Ridge Parkway in east Asheville at the Folk Art Center is just 20 minutes from Inn on Mill Creek. From this starting point, travel south to explore the 434-acre North Carolina Arboretum as well as Mt. 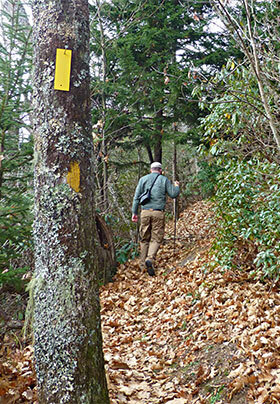 Pisgah and Graveyard Fields. Heading north will bring you to beautiful Craggy Gardens, with 360-degree mountain views and loads of blooming rhododendron in late spring. Further north is Mt. Mitchell State Park, home of the tallest peak in the eastern United States, and beyond that are Grandfather Mountain and Linville Gorge, all great hiking spots. An alternative to the Asheville entrance is to head east from the Inn on Highway 70 through Old Fort and then travel Highway 80 to the Parkway north of Asheville and Mt. Mitchell. One of the questions we get asked the most is, “When is the best date to see fall foliage in your area?” It’s a tough question, because western North Carolina generally sees at least six weeks of color, beginning in late September/early October at the highest elevations. Then, the wave of reds, golds and oranges washes slowly downward to lower elevations during the entire month of October. The peak time to see fall foliage at our elevation (2,300 feet) is generally October 21-31. The Blue Ridge Parkway north of the inn peaks earlier, while Chimney Rock State Park south of the Inn typically peaks during the first part of November. Keep in mind, these date ranges vary based on what Mother Nature feels like doing each year! Check out our weekly fall foliage reports on the blog to keep track of which tree species are changing and where the best places are to take a “leaf peeping” scenic drive during the season. If you’re a geocacher, you might be like us and put together lists of caches to find during your travels. Check out the Fire Road series of 20+ geocaches placed by several local cachers along the Forest Service access roads just above Inn on Mill Creek. In addition, great caches are waiting to be discovered on trails at Warren Wilson College and Montreat College, around Asheville, near Chimney Rock State Park and the NC Arboretum, the town of Black Mountain and along the Catawba Falls Trail. Ask when you arrive — we have hiking trail maps for all the area’s trails. GUIDED CATCH-AND-RELEASE FISHING TRIPS: Our friends at The Catawba Angler are local fishing experts and lead guided catch-and-release fishing trips in area waters, such as the French Broad River near Asheville and Curtis Creek, the Catawba River and Mill Creek right here in Old Fort and McDowell County. Whether you’ve been fishing your entire life or this is your first time, The Catawba Angler’s expertise and tailor-made trips will make for a an unforgettable adventure. Plus, they provide all gear, transportation and snacks. Call 828-460-2390 to book a half or whole day fishing trip during your stay at Inn on Mill Creek. GUIDED MOUNTAIN BIKING EXCURSIONS: Our friends at Pisgah Mountain Bike Adventures lead professionally guided excursions for individual riders, couples and small groups at all experience levels. Explore excellent mountain biking trails in the greater Asheville area, including Dupont State Forest and Pisgah National Forest, with experienced, expert guides who are well-versed in the area’s trail systems. Call 828-393-0101 to reserve a guided mountain biking trip during your stay at Inn on Mill Creek. Sponsored by the McDowell Arts Council Association, the McDowell Quilt Trail is our county’s driving trail of quilt squares on display. We have two right here at the Inn! Businesses, organizations and residents sponsor the blocks on their buildings and get to pick the design and colors, so all the blocks are unique, handcrafted and painted by local artists. View more than 100 quilt blocks while driving on the McDowell Quilt Trail; maps are available at the McDowell Tourism Authority’s offices in Old Fort. Sure, breakfast is the most important meal of the day, but lunch and dinner aren’t far behind, especially in an area known as Foodtopia. Farm fresh local ingredients reign supreme here in western North Carolina, and you’ll find “buy local” to be the norm, with several farmers’ markets and family farms supplying fare for many of the local restaurants. You can even take a walking food tour of Black Mountain through Creative Mountain Food Tours. No matter what type of cuisine you seek, there’s a good chance you’ll find it here… Southern, contemporary American, Italian, Thai, Indian, French, bakeries, chocolate, pizza, burgers, steak, seafood, vegetarian, vegan, gluten free, organic, our area has it all. And we have menus for all our guest favorites in Black Mountain and Asheville. So eat well while you’re here and let us know if we can help with finding a restaurant and making reservations. In addition to fabulous dining, Asheville has been crowned Beer City USA multiple times, with more microbreweries per capita than any other city in the nation. Currently, there are more than 30 breweries. If you like to sample local craft beer, view our handy map of Asheville area breweries, brewpub/gastropubs and taprooms. Take the Brews Cruise of Asheville area breweries or embark on the Asheville Ale Trail. And if wine is more to your liking, check out our map of local wineries and wine shops.